Launching Powerful Youth Network: #FreedomCampus! 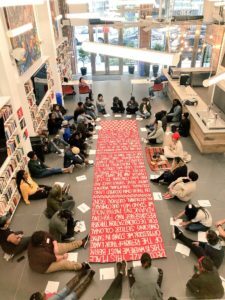 On October 13- 14, 2018 we convened students from over two dozen universities from around to country to build a #FreedomCampus Network. June 2018, Austin City Council Votes In Favor Of #FreedomCity Policy!! Grassroots Leadership led an effort to establish the first Freedom City. In June 2018 Austin City Council unanimous voted to pass a Freedom City Policy, which favors measures to increase the safety of people of color and immigrants in Austin. Austin’s Freedom City Policy will take steps to reduce racial disparities in arrests, reduce discretionary arrests, require full vetting and reporting on requests by ICE for APD resources, and ensure officers who ask about immigration status inform people of their rights to not answer, as well as complete a report explaining the encounter. It is clear by the hundreds of people who showed up at City Hall that the community strongly stands with Black and Brown and immigrant communities. No longer should communities be allowed to be over-policed, discriminated against, and ripped apart from one another due to racist policies. The city deserve policies that reflect the best interests of community members. Freedom to Thrive (Formerly Enlace) led a multi-racial, multi-sector coalition united across the coasts on May Day 2018 representing the power of Freedom Cities. Over forty organizations marched with Enlace under the Freedom Cities banner in New York City, while in Oakland, the Ella Baker center turned in full force at a rally hosted by Oakland Sin Fronteras. Video of our Freedom Cities Immigrant Worker Justice Tour in NYC is below.